If most people are like us, then they have cords and adaptors all over the house and office to keep all of their fancy technology charged. You might have an adaptor in one AC outlet with your phone plugged to it, then another adaptor plugged in for your tablet. Then you have your Bluetooth speaker system plugged into another wall and even a few more plugs to charge a kids tablet and a portable speakerphone for conference calls. DockAll, the revolutionary all-one-dock station for smartphones and tablets that is reinventing what a docking station should be. A wireless, wired and HI-FI Bluetooth sound system all built in a sleek good looking package. In the "Age of Wireless" homes and offices are increasingly cluttered with more and more wires to keep personal devices powered and functioning. An adapter for the phone, another for the tablet, one for the Bluetooth speaker system, another for conference calls, and it's easy to see how the wires begin to add up and take space in homes and offices. Azpen has created the DockAll as the solution to all of the above with an incredible design that truly embraces the definition of wireless. Support phones & tablets up to 13"
but if you want to charge iphone 7/6/5, you need a wireless charge receiver! 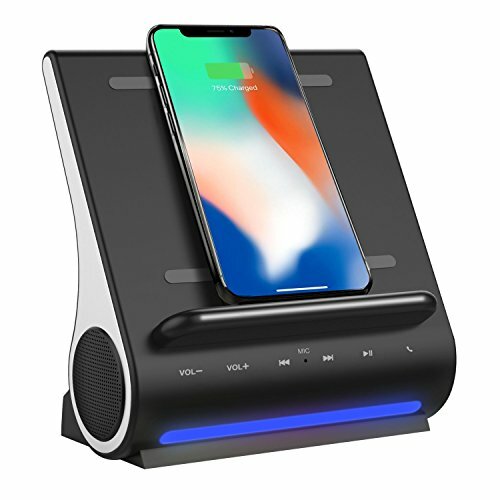 The DockAll D108 Docking Station can wirelessly charge compatible phones or devices equipped or enabled with "Qi" wireless technology while sitting on the docking station, the wireless charging has 15W output. For phones that are not "Qi" capable, the docking station has two variably powered USB ports on the back for charging additional devices. Enjoy your favorite tunes through the two - 5 watt Bluetooth speakers. Since it connects with NFC (near field communication) Bluetooth, there's no need for a password, just enable Bluetooth on your device and it pairs automatically to the DockAll. With the built-in microphone you're able to make and receive speaker calls, the perfect Skype utility for the home or office. The MicroSD port accepts SD cards up to 64GB that provides another source for listening to stored audio files. The DockAll combined with the "Qi" Wireless charging and the two variably powered USB ports can simultaneously charge 3 devices at once. The USB ports provides an additional source for charging other items such as tablets, laptops, non-"Qi" wireless phones, MP3 Players, Fit Bits and more. The wide dock will accommodate devices up to 13" wide. Compared to other "Qi" Wireless chargers that require a device to lay flat as it charges, the DockAll wirelessly charges devices at an upright, comfortable viewing angle. Supports "Qi" Wireless integrated or enabled devices including: IPhone 8, 8 Plus, X (10), Samsung Galaxy S7, S6/Edge, S5, Note4, Google Nexus, LG Optimus G Pro, G6, Sony, Xperia Z4V, Z3V HTC, Motorola Droid Series, Microsoft Lumia, 1520, 1020, 930, 929, 928, 920, Blackberry Priv, Z30, Catphone S50, Kyocera, Hydro Elite, Urbano L01, L03, Torque G02 and any other Qi wireless integrated or Qi enabled phones or devices. If you have any questions about this product by DORNLAT, contact us by completing and submitting the form below. If you are looking for a specif part number, please include it with your message.